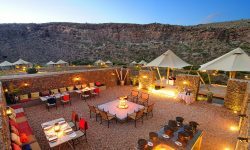 Seated at the foot of the Warm Waterberg Mountain Range in the heart of South Africa’s Little Karoo, Sanbona pays tribute to the San people who made this arid environment their home for centuries. Sanbona has an alluring atmosphere of stillness, an air of isolation amid the raw beauty and boundless plains. Sanbona and the spirit of the San people welcomes you. Beautifully appointed tents exude an atmosphere of pioneering adventure in a vast and hidden landscape. 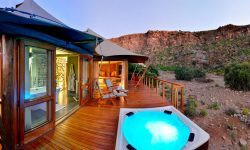 Dwyka Tented Lodge is surrounded by awe-inspiring rock formations which was once the home of ancient San hunters. 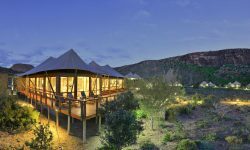 Situated on a horseshoe bend of a dry Karoo ravine. The lodge facilities include: Open-air dining boma, Lounge with re place and TV with satellite channels, a well stocked Wine cellar, Gift boutique and wonderful Relaxation Retreat with 2 therapy rooms, Wi-Fi. All luxury tents can sleep a maximum of 2 adults per tent 2 Twin bedded Luxury Tents 7 King bedded Luxury Tents with Comfort cooling/heating, En-suite bathroom, shower, twin basins and free-standing bath, Outdoor shower, Private deck with plunge pool, Private minibar, Tea and coffee making facilities, International dial telephone, Under floor heating for the cold nights and Electronic safes.